Everything you need, nothing you don't. 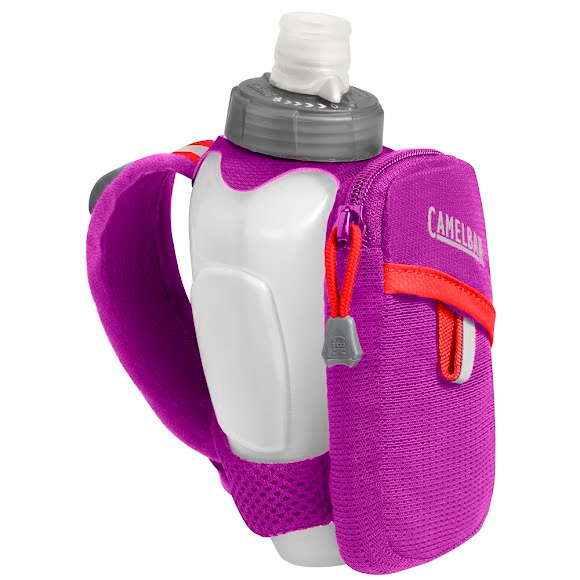 The Camelbak Arc keeps 10 ounces of water close by, with an adjustable cinch strap and a curved bottle designed to fit your hand snugly. The essentials pocket has just enough room for your card, phone, keys and gels-all in a package so light that you'll almost forget you're carrying it. Everything you need, nothing you don&apos;t. The Camelbak Arc keeps 10 ounces of water close by, with an adjustable cinch strap and a curved bottle designed to fit your hand snugly. The essentials pocket has just enough room for your card, phone, keys and gels-all in a package so light that you&apos;ll almost forget you&apos;re carrying it. And the Podium bottle features patented Jet Valve technology with a lockout dial for leak-proof transport. Materials 70D diamond clarus w/ darlington stretch mesh.